Are you looking for a new Walk-In Shower for your home? The bathroom safety experts at Independent Home Products, LLC help many people increase bathroom safety in their homes. Independent Home Products, LLC has been a proud installer of walk-in showers since 2007. 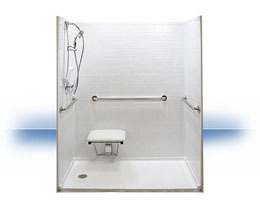 Walk-in showers are designed for people with limited mobility that prefer a safe and easy shower rather than a tub. Advances in adaptive equipment enables the aging population and those with limited mobility to remain in their homes longer, increasing independence and quality of life. One of those advancements is the walk-in shower. Walk in showers are doorless showers that have no to low thresholds for easy and safe entry and exit. Independent Home Products, LLC has a full line of Walk-In Showers to meet type of remodeling need. These units are specifically engineered to transform a tub/shower into a beautiful and safe walk in. Let Independent Home Products, LLC help you choose the perfect Walk-In Shower. Most will fits into the same space occupied by a traditional tub/shower. This replacement can often be completed in less than two days so you do not have to be displaced from your bathroom for a long period of time. Enclosure: Up to 55.75" x 68.25"